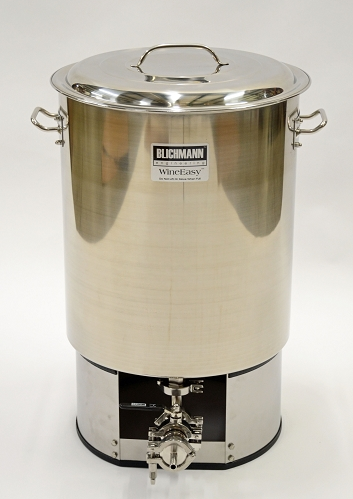 Blichmann Engineering WineEasy fermentor is different then anything on the narket. It`s extremely easy to use and traditional fermenting and pressing techniques simply can`t rivial its results. The high-quality stainless fermenter (20, 30, or 55 gal size) is uniquely designed with a false bottom located at the bottom of the fermentor to allow the pomace to be seperated from the wine while draining the unit. The tines on the pressure plate support the bottom of the fermentor and perforated false bottom to keep it from collapsiing from the pressure imparted by the vacuum pump. 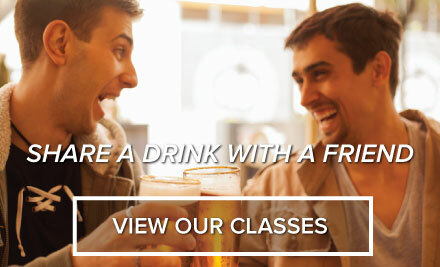 After the alcoholic fermentation, the free run is drained or pumped out of the fermentor. At this point the sliding piston assembly is then installed to do the rest. The vacuum pump evacuates the carboy (or other vacuum capable vessel) and applies a vacuum under the false bottom of the WineEasy fermentor. This causes atmospheric pressure to push down on the sliding piston pressing the pomace to the ideal maximum pressure of 14 PSI to avoid hard-press conditions. Because all of this is done without transferring the pomace to a press and in a completely closed air-tight system oxidation contamination and mess are virtually eliminated. Cleanup is as easy as scooping out the dry pomace into a container and washing out the high-polish stainless steel fermentor.